Open all year. An Mature accommodation ...Minimum 5 night stay rates displayed . 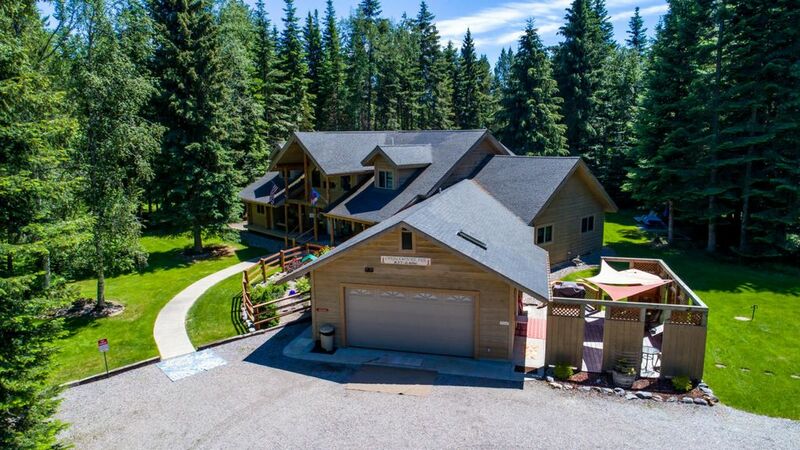 Massive 4800sf Lodge style cedar and log home 3 miles or 5 minutes away from the quaint village of Bigfork, Flathead Lake, Jewel Basin and Glacier National Park. Less then an hour to each ski resorts. 5 private rooms 5 total beds with king and queen size pillow-top super comfortable beds. Sani-Jet hydrotherapy tubs with showers in the king deluxe rooms. Soaking tubs and showers in the 2nd floor rooms. Smart 65' big screen TV in the common family room. No smoking, NO children under the age of 10, NO pets allowed as I have two cats on the premise. Large Country dining room and kitchen with full compliment of quality appliances and kitchenware accommodates 10 max. responsible guests. BBQ grills, campfire area all secluded on 10 acres with snowshoe and X/C paths. At the end of any extended weekly rental housekeeping will incur with an additional fee. Plenty of room for parking trucks, boats and trailers. Concierge services available for activity planning and events. Order the 101 book from the Bigfork Chamber. NOT conducive for small children as antique, quilts, breakables are irreplaceable and very expensive. Onsite Massage therapist has a room on the 2nd floor. Penny Capps 406-407/6669 or email her pennyrcapps@yahoo.com. She is board certified and trained in Swedish, Deep Tissue, Geriatric, and Sports Massage. She is also certified in Active Release Techniques (ART) and trained in Lymphatic Drainage Therapy. She is vetted into the US Olympic Committee's Volunteer Medical Program and the USA Weightlifting Sports Med Society. Advance notice is required to schedule a massage at the Inn with Penny. My home is secluded and quiet yet easy access to all the main reasons to visit Glacier National Park, Bigfork, Flathead lake, Jewel Basin, for summer activities...Big Mtn and Blacktail ski resorts or less than an hour away. Dog sledding, X/C skiing snowmobiling are so fun (weather permitting) Lovely dining, the Playhouse events and a picture postcard village of Bigfork. I live onsite with my own private accommodations with my two loves, Bella and Abby, the resident cats. We had a wonderful stay at the beautiful Candelwycke. The rooms are wonderful, it's a quiet, beautiful, peaceful place and Megan is a gracious host. Thank you Moe family. It was my pleasure to be one of your host homes. Candlewycke is a spacious, comfortable, and well appointed and maintained property that easily accommodated my wife and I and our three daughters and their families. The setting is Idyllic with well maintained grounds and trails on the property.and an occasional visit from one or more deer looking for a treat. The owner, Megan Moore, makes sure that you are comfortable and is very gracious to work with. It was a superb experience for our family. Any damage due to smoke, spills or excessive kitchen cleaning, will incur an additional "avg. daily rate" entire Inn $1075, until the property can be rented again. Return the kitchen to its original state when you arrived. If you rearrange the cupboards, please put the items back. Discard any food you're unable to eat or take with you leftovers. Any broken items will be discussed as to their value, keeping in mind irreplaceable antiques, quilts, and keepsakes. No pets allowed on or in the premise. Keep in mind I have 2 cats that have total accessto their home. No smoking inside the home, outside area is designated. Not conducive for children under 12 yrs old.